a FUN CAKE IS A VERY SPECIAL CAKE - IT WILL TASTE GREAT AND LOOK AMAZING! Birthday cakes for boys, girls, children, special birthdays like 18th, 21st, 40th - lots of great ideas! Inspirational christening cakes based on favourite toys, TV shows or any other theme. Novelty or traditional christening cakes - you like it, we will create it! From the classic wedding cake to the novelty wedding cake, single tier, or many tiers, we will create the perfect wedding cake just for you! Toys, TV themes, animals, charterers, Fun. Some great kids birthday cakes, lots of ideas to inspire you. Cakes for the boys and the men - Cars, planes, bikes, music, Play Stations! You name it, we can create a cake idea just for you. Lots of wonderful birthday cake ideas for the girls and ladies - Handbags, shoes, make up, flowers, animals. all decorated and created to suit your birthday theme. From a simple number 1 birthday cake, to an elaborate multi tier 40th birthday celebration! Sports birthday cakes are very popular, a football cake, cricket cake, or cakes based around sailing, fishing, golf, darts - perfect for the sport lover in your life. Our Wedding cakes are extra special, matched to your colour scheme, created to provide the perfect photo opportunity at cake cutting time! Other popular cake categories include: Novelty cakes, Christening cakes and Cupcakes. Happy browsing! My Facebook page has lots of photos to flick through, including the top 3 cakes from the previous month, like a Thomas the tank engine cake, a magic hat cake and a rocking horse themed cake. Take a look at some of the reviews on Facebook, or if I have made a cake for you, please leave a review. The quickest way to send an enquiry or ask for a quote is by using the form. 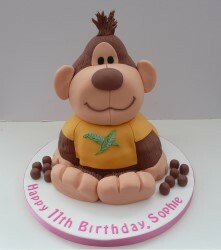 Fun Cakes is based in Locks Heath, in between Southampton and Portsmouth. © Fun Cakes. All rights reserved.